This audio adaptor lets you easily add high quality 16 bit, 44.1 kHz sample rate (CD quality) audio to your projects with Teensy 3.0 or 3.1. It supports stereo headphone and stereo line-level output, and also stereo line-level input or mono microphone input. An advanced audio library lets you use the input and output simultaneously together with a toolkit of audio processing objects, to easily create all types of sophisticated audio applications. You can play multiple sound files, create synthesized waveforms, apply effects, mix multiple streams and output high quality audio to the headphones or line out pins. An optional Thumbwheel Potentiometer can be added for volume or control an audio pramater. 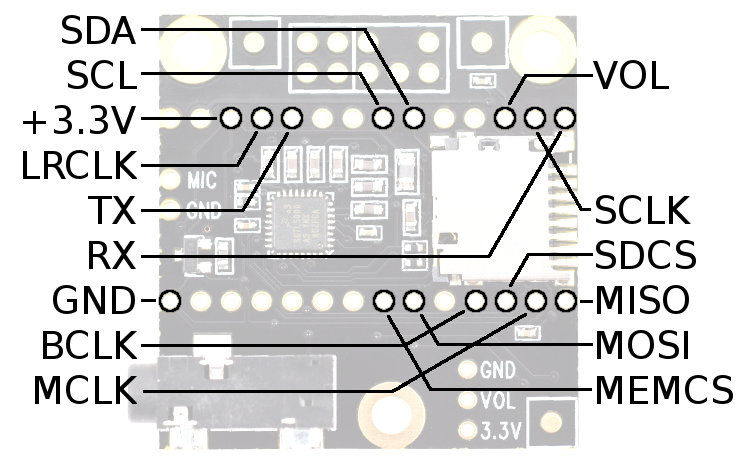 Teensy 3.0 & 3.1 have the Cortex-M4 DSP instructions which provide plenty of computational power for real-time FFT (spectrum analysis), opening up the possibility of creating advanced sound-reactive projects. Two of these 14x1 pins can be used to easily soolder the Teensy 3.0/3.1 and audio board together. The audio chip, part number SGTL5000, connects to Teensy using 7 signals. The I2C pins SDA and SCL are used to control the chip and adjust parameters. Audio data uses I2S signals, TX (to headphones and/or line out) and RX (from line in or mic), and 3 clocks, LRCLK (44.1 kHz), BCLK (1.41 MHz) and MCLK (11.29 MHz). All 3 clocks are created by Teensy3. The SGTL5000 operates in "slave mode", where all its clock pins are inputs. The SD socket is accessed with 4 SPI pins. SCLK and MOSI are used at alternate locatoins. See the audio library examples for details on how to select these different pins. The SD card is useful for playing music. Sandisk and other good quality SD cards are capable of playing 2 WAV files simultaneously. An optional W25Q128FV flash memory chip on the bottom side is also accessed using SPI, with the MEMCS pin to select the chip. Future versions of the audio library may use this low latency flash memory for short audio clips or wavetable synthesis. Currently there is no software support for this chip. The line in/out header uses a pinout compatible with the AC97 audio header on PC motherboards. The front panel cables from most PCs can be connected, or wires can be soldered directly to the pins.